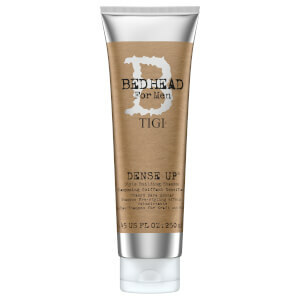 Cleanse and style in one step with TIGI Bed Head for Men Dense Up Thickening Shampoo, an innovative formula that adds body and texture to minimise styling time. Infused with a refreshing Basil Mint fragrance to kickstart your day, the shampoo expertly sweeps away dirt, excess oil and product build-up whilst delivering lift and control to allow you to create your style as you shower. The intensely moisturising formula strengthens each strand and balances the scalp for a hydrated, healthy and salon-quality finish. Lather into wet hair, massage into scalp and rinse. Follow with your favourite Bed Head for Men™ styling product. Water (Aqua/Eau), Sodium Laureth Sulfate, Acrylates Copolymer, Cocamidopropyl Betaine, Glycerin, Fragrance (Parfum), Biotin, Caffeine, Niacinamide, Sodium Chloride, Sodium Benzoate, Carbomer, Pentylene Glycol, Guar Hydroxypropyltrimonium Chloride, Citric Acid, Disodium EDTA, Phenoxyethanol, PEG-45m, Ammonium Hydroxide, Silica, Butylphenyl Methylpropional, Geraniol, Hexyl Cinnamal, Limonene, Linalool.